Today’s culinary inspiration is adapted from the folks at feeding my ohana - after my friend Dave posted a link to their version of a Sam Choy dish on Facebook, I knew I wanted to make it TheOccasionalVegan-style. 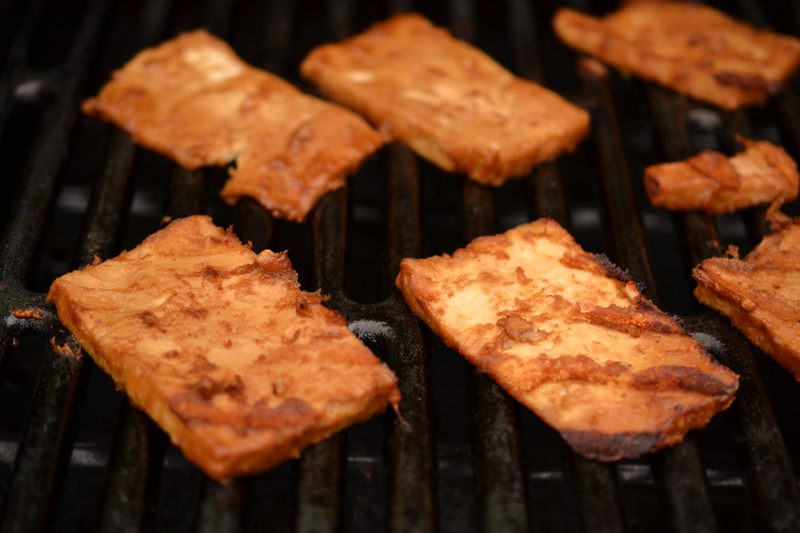 Rather than chicken, I marinated well-pressed tofu and then threw it on the grill. Afterwards, I layered it in a flour tortilla with some freshly-cooked sushi rice, a little extra of the marinade, and green onions. 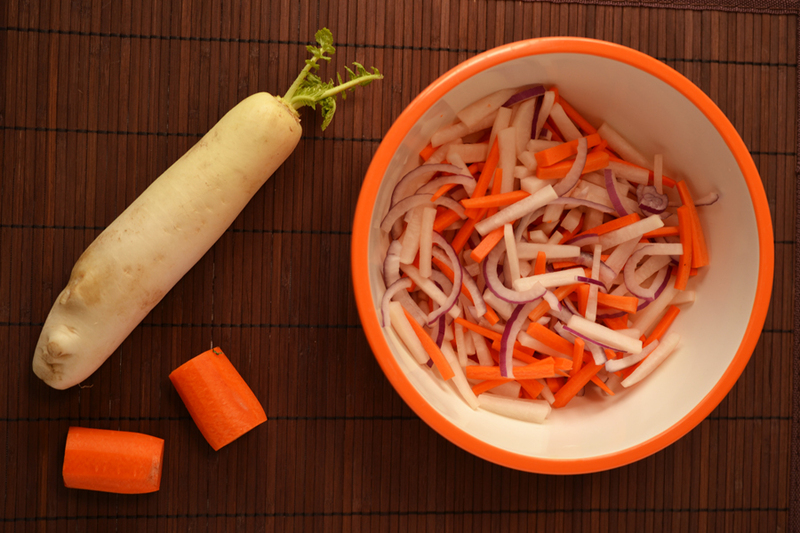 To help offset all of the soft textures, I whipped up some daikon and carrot slaw for a much-needed crunch and tart offset. After the recipe, I’ll share some additional tips/notes on other things I’ll try next time. Press the tofu between two plates, with weight added to the top (cookbooks, other dishes, anything!). It’s very important to do this for at least 30 minutes to help remove the tofu’s water. Drain occasionally. Mix all marinade ingredients with a whisk. 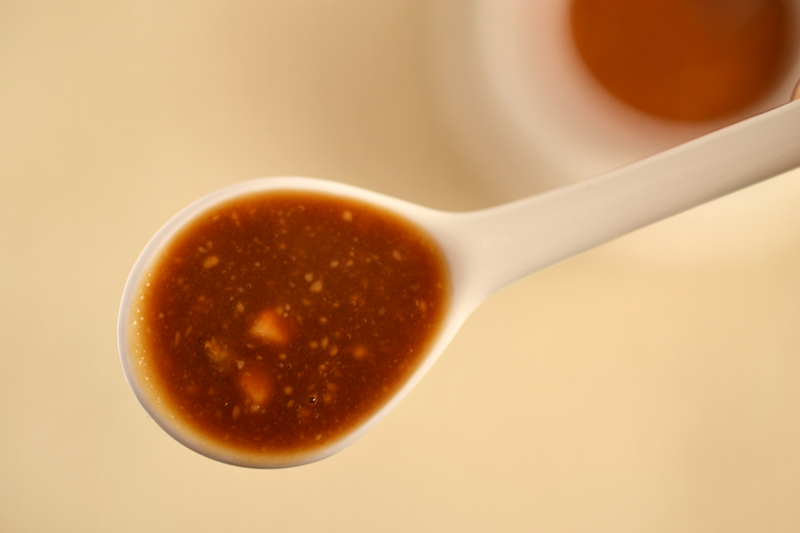 You can use either crunchy or smooth peanut butter, but make sure to use white or yellow miso, not red. Pour half of the marinade into the bottom of a 9 x 13 baking dish, spread evenly. Lay tofu slices over the top in a single layer, and pour the other half on top. Make sure each piece is coated. 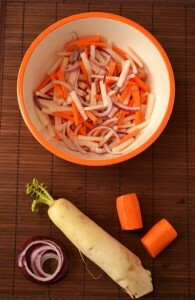 Ensure that the carrots and daikon are julienned in similar sized pieces, around 1.5 to 2 inches long. Make sure you only use the bottom end of the daikon – daikons have a different taste and use depending on the area. The bottom part (away from the greens) is peppery and similar to radish. The part near the greens is tougher and lends itself well to slow poaching and cooking for Japanese stews. You want roughly the same amount of carrot as daikon. Once the tofu has marinated for awhile, grill it on medium heat, a few minutes each side, till there’s gorgeous grill marks. 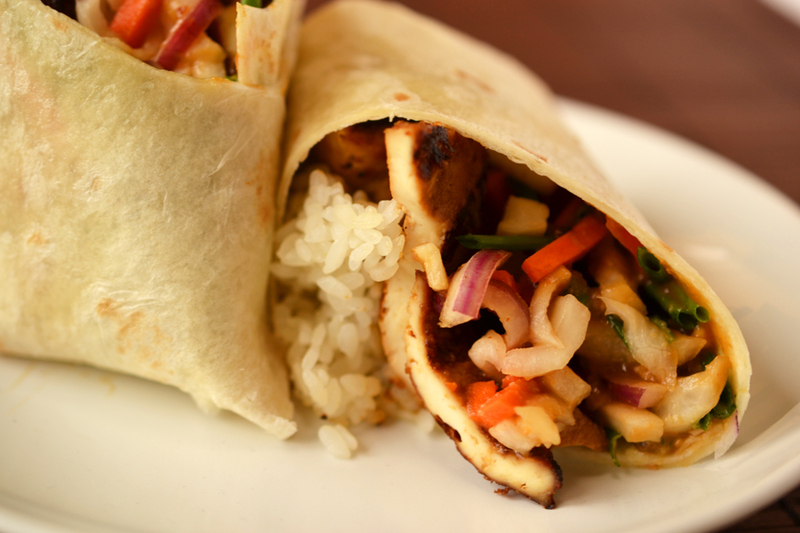 Assemble the wrap by layering around 1/3rd to a 1/2 cup of rice, 4 slices of tofu, 1/4 to 1/3rd cup of slaw, a very small dollop of extra marinade ( or leave it off, depending on how strong you want it), and dusting of green onions. Roll like a burrito and enjoy. Though the tofu is tasty and has a lot of flavor, I personally prefer it a lot chewier. The marinade has so much flavor in it that next time, I’ll probably try cooking the tofu like we do for pad thai (pressed, put onto parchment in a hot oven with olive oil, and allowed to cook until very chewy). While that method won’t infuse the tofu with marinade, adding the sauce into the wrap I think would be a really good combo and the tofu would be a much better texture. If you don’t have access to daikon, buying pre-bagged coleslaw is probably an acceptable substitute, though it won’t be as crunchy and coleslaw gets soft really quick. 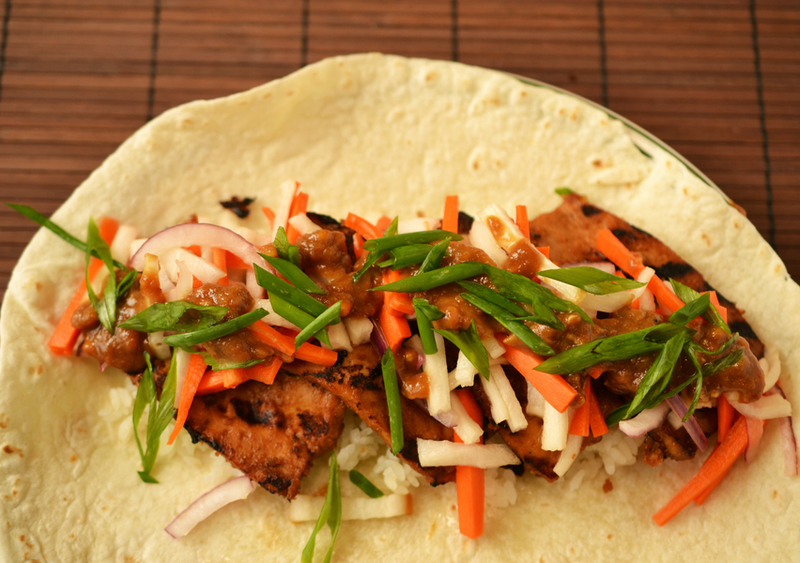 5 Comments on "Asian wrap with grilled peanut butter, miso and beer tofu and daikon slaw"
Thanks for the link. And what a great idea to use tofu! I think I’ll try your version next time with a combo of Korean black rice and Sukoyaka genmai organic brown rice that I’ve been playing with lately. Thanks for stopping by Laurie! The black rice sounds like an amazing idea. 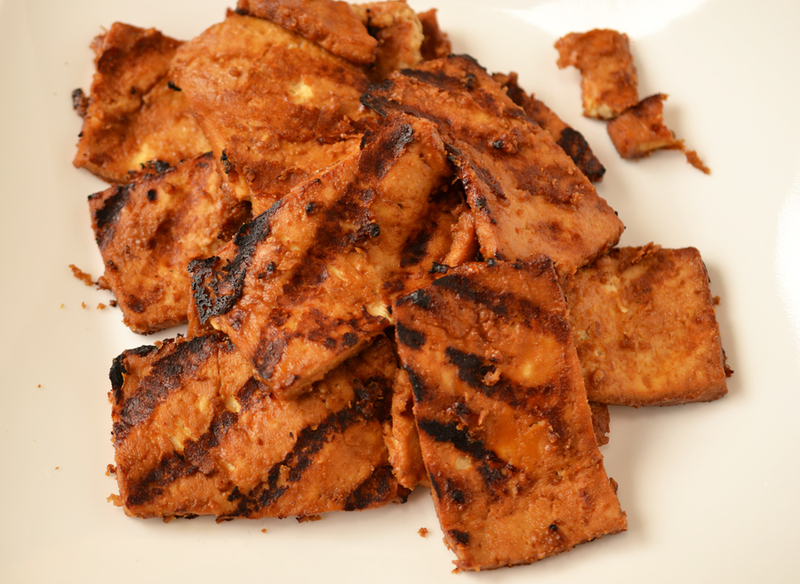 If you like chewy tofu as much as me, try out the baked idea… I think super chewy (but still with marinade) would be an amazing combo. And thank you so much for the kind words about the blog! Also, my friend Karen had an excellent idea to try out broccoli slaw instead of cabbage for another easy, crunchy way to garnish the dish. Great idea! You’re amazing Kim! This makes me want to start serving lunch at Fuurin-Oka… Love the look of those cute julienned veggies.